The Superlux HMC631 Gaming Headset is a solid addition to the inventory of any player that would like a pair of headphones that are comfortable, customizable, and at the head of the class in regards to sound reproduction. The HMC631 headphones are able to playback music from bass-heavy (rap, EDM) to vocal-intricate (opera, country) genres in a compelling fashion. Furthermore, vocals (video game dialogue, phone calls) are clear and crisp without crackling or otherwise sounding muffled. When there are a multitude of voices / atmospheric noises, the HMC631 headset does not shudder from the challenge – everything is sorted out in a more than satisfying way. The audio quality of the included boom microphone is high, meaning that individuals will easily be able to converse, give directions, or otherwise stay active with friends or family. We were particularly surprised with the build quality of the HMC631 headset, meaning that the product will take bumps and drops admirably. The rugged nature of the HMC631s ensure that one can tote the headset around in a backpack or in a car without the product being any worse for wear. The comfort of individuals is a prime concern for Superlux/Avlex, and the padded headband makes marathon gaming incredibly easy. The variety of settings that one can orient their HMC631s makes this a must-have for anyone looking to upgrade their battlestation. 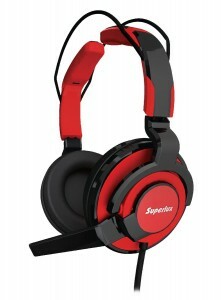 The MSRP on the Superlux HMC631 Gaming Headset is around $100; look online to find the best price for these headphones. These would be a perfect holiday or birthday gift for anyone that wishes to be fully immersed into their video game experiences Check out the Superlux website for information about the company’s full array of gaming products, while the Avlex website has a panoply of description about their entire range of audio products.